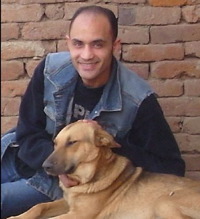 The Egyptian blogger Tamer Mabrouk was punished yesterday, not by being sent to a prison cell, but was fined L.E. 2500 (446 USD), and civil compensation of L.E. 40.000 (7272 USD). A Court of Appeal in Port Said (Suez Canal) upheld the decision to sentence the blog Al-Hakika Al-Mesreyya (The Egyptian Truth) to a fine for Trust Chemical inc., which has filed a Libel and Slander case against Mabrouk in June 2008. Mabrouk revealed in his blog that Trust Chemical had dumped chemicals into Manzallah Lake and the Suez Canal, which have catastrophic effects on water and fish. In his blog, he is putting a badge calling the visitor to stand together against this factory, which is polluting the environment. Mabrouk also reported on harsh working conditions in the company. This sentence is to be the second case in Egypt of punishing a blogger for what he writes on the internet. The first case is the blogger Kareem Amer, who has been in jail as sentenced for 4 years because of posting anti-Islam writings and insulting the Egyptian president Hosni Mubarak on his blog. I hope justice is served. The company should be fined, not the blogger who blew the whistle!